The Solomon Islands government today signed a Host Agreement with the Secretariat of the Pacific Community (SPC) to establish a National Coordination Office of SPC in Honiara. Minister of Foreign Affairs and External Trade William Haomae and Director General of SPC, Dr. Jimmie Rodgers signed the Agreement in the presence of top government officials and staff of SPC. The arrangement is the first of its kind in the region and Solomon Islands is the first member country to establish a National Coordination Office following the signing ceremony. Minister Haomae said the establishment of the Office is an important leap in the partnership between Solomon Islands and the SPC which fulfills one of the key policy objectives of the present ruling CNURA Government to work closely with international and regional organizations in enhancing the welfare of people. “The new development is an example of the closeness and trust that this government established and will continue to enhance with the regional organizations in the Pacific,” he said. The in-country office is established to oversee the implementation of the Solomon Islands and SPC Joint Country Strategy (JCS), 2009 - 2012. 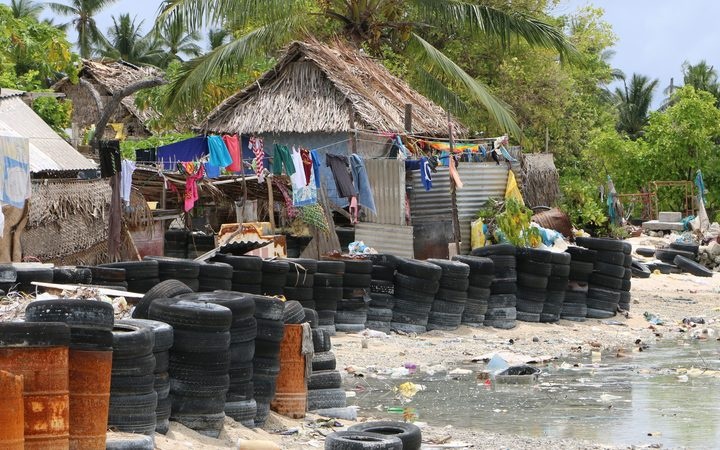 The Strategy was formulated to guide the provision of SPC technical assistance and other support services to Solomon Islands over the next four years. Haomae said the timing of the Solomon Islands Government and SPC Joint Country Strategy is significant as it comes at a time when Government is undertaking reforms and emphasizes its intention to ensure “people” are at the centre of development. “It is pivotal for us to perceive ‘people’ as the centre of our responsibilities and programs of our respective institutions,” he said. Haomae said the government is encouraged to note that the programs of SPC in Solomon Islands is aligned with the priorities of the CNURA Government, underpinning the concept that development can only be regarded as development when it has positive effects on lives of our constituents and neighbours of their communities. The hosting by Solomon Islands of a formal office of the organization fulfils the instructions by SPC’s governing body made in 2005 at its Palau Conference for SPC to decentralize the location of its services beyond its headquarter in Noumea and regional office in Suva and move services closer to the people. Director General of SPC, Dr Jimmy Rogers said the signing of the host country agreement is a testimony to the commitment by the government to continue to play its part in support of Pacific regionalism, in particular those targeting increased delivery of services to members. SPC currently has a substantial programme of assistance to Solomon Islands covering a wide range of sectors including Agriculture, Communication (digital and audio), Culture, Education (TVET and skills development), Fisheries, Forestry, Health, Human Rights, Maritime and Transport, Media, Parliamentary support, Statistics / demography and Planning and Youth. Dr Jimmy Rogers said a major function of the national coordination office in Honiara is to ensure that all the services provided to the country by the various SPC programmes are coordinated, monitored and quantified so that both the member country and the organization has a good overview of the scope, extent and value of regional services provided to Solomon Islands by SPC annually. Mr Haomae has expressed the Government’s gratitude to Dr Rodgers and his team at the SPC, for their tireless efforts in their response to the Government’s request to have a meaningful SPC presence in the Solomon Islands. “With a stronger and meaningful presence on the grounds, our Government and other stakeholders will work more closely with the SPC officers to create greater coherence and improve the efficiency and effectiveness of our programmes as stipulated in the Joint Country Strategy,” Haomae concluded. A joint ribbon cutting ceremony to officially open the Office at the Antony Saru Building took place this afternoon. Find more from Solomon's Government Communications on InfoPages.